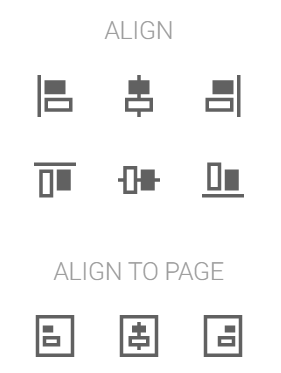 You can align elements in your template by using the Align options on the right hand menu below the Layout section after selecting an element/s. Let's learn more about the alignment tools! Align to Page Left pushes the element to the far left of the page limit. Used with one element. Align to Page Center pushes the element to the exact center of the page. Used with one element. Align to Page Right pushes the element to the far right of the page limit. Used with one element. Align Left will push two (or more) elements so that they will be on the same level of their left hand side. Align Center will push two (or more) elements so that their centers will be aligned. Align Right will push two (or more) elements so that they will be on the same level of their right hand side. Align Top will push two (or more) elements so that they will be on the same level of their upper side. Align Middle will push two (or more) elements so that they will be on the same level of their middle side. Align Bottom will push two (or more) elements so that they will be on the same level of their bottom side.